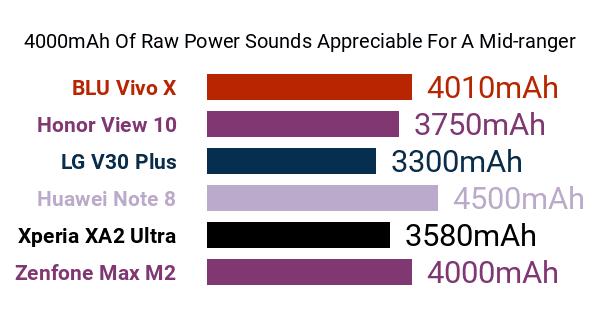 A follow-up to Asus's endurance-focused Zenfone Max (M1), the Asus Zenfone Max M2 sits alongside other big-battery phones on the market with its 4000mAh battery cell . However, our review of its technical pros and cons reveals that this 2018 Zenfone edition is far from a flawless mid-level smartphone. For starters, it runs on a middling Qualcomm Snapdragon 632 64-bit octa-core processor, which peaks at only 1.8GHz -- in comparison, most eight-core smartphones worth their salt use chips that clock in at 2.2GHz or higher. Accompanying its processor is a reasonable (as of this Phonerated analysis) 4GB RAM. For users who are not that demanding when it comes to multitasking, though, Asus also offers a 3GB-only version. As for storage, while we think that the Zenfone Max M2 could have done better than a 32GB-only internal memory , the fact that this mid-ranger supports a whopping 2TB's worth of top-up memory makes that con more than forgivable in our book. As for the rest of its pros, this high-stamina Zenfone banks on a large 6.3-inch display sitting on a 19:9 aspect ratio , which was among the widest screen setups available when we were checking out its specs -- explore some of the best phablets and large-screen phones here. That being said, its large display is marred by a 1520 x 720 (HD sharpness only , whereas some tantamount 2018 models boast FHD or FHD+ (1080p) interfaces. This 7.7mm-thin Asus model is equipped with a dual main camera made up of a 13-megapixel primary lens and a 2-megapixel subsidy lens for depth-of-field analysis, with AI scene recognition leading its imaging pros and cons. Up front is a so-so 8-megapixel selfie camera that's accompanied by a diffused LED flash. The Max M2's other features include a twofold biometric user authentication system -- it has a physical fingerprint scanner sitting right underneath its rear camera, while its aforementioned front cam carries the phone's facial recognition system. This model comes with dual SIM card slots and it dons either a Black or a Blue finish. Running on the Android 8.1 Oreo platform, the Zenfone Max M2 is a smartphone for mid-range shoppers who are cautious in terms of budget and battery life.